« Another child in a Million, another vaccine? Today when heath care professional talk of measles, they talk of a “killer disease” they say two people die every thousand cases, this is simply not true . Those who choose not to get the MMR vaccine are, in essence, putting the peoples lives at risk. 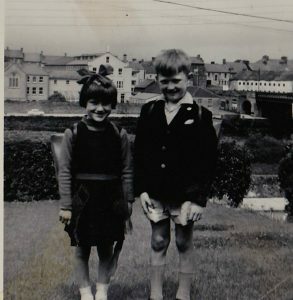 My sister and I had measles in 1964 as did most of our school, a week off. This picture was taken on the Monday we went back. In the 60s getting measles was seen as funny, this is how it was portrayed on various TV programmes at the time, I am not disputing some children had complications associated with the infection but by enlarge it was a mild infection and that is how the medical profession viewed it. Are we seriously expected to believe that this infection has now become a “Killer disease” despite all the advances in health care and housing. A recent “outbreak?” caused panic, perhaps because the medical practitioners dealing with measles cases from Disney Theme Park, had not seen it before and panicked believing the vaccine industries sales pitch; “Killer disease”. All survived those infected survived without complications. When I was writing my Masters Dissertation on Vaccination, I spent much time in the Library of the Welcome Trust looking through old medical journals to see what they were saying during outbreaks in the 60s. In the first 3 weeks of 1959 there were 41,000 cases, yes no mistake forty one thousand cases in the UK. In the first three weeks of this year about 41,000 cases of measles were recorded in England and Wales. This is well above the corresponding figures of the last two years – namely, about 9,000 in 1958 and 28,000 in 1957 – though it is below the highest levels reached in the last nine years. To give some idea of the main features of the disease as it appears today and of how it is best treated, we invited some general practitioners to write short reports on the cases they have seen in their practices recently. We are much indebted to the general practitioners whose names appear below for the following notes on the present outbreak of measles. Measles was introduced just before Christmas by a child from Petworth ……. Treatment of Attack. – No drugs are given for either the fever or the cough; if pressed, I dispense mist. salin. B.N.F. as a placebo. Glutethimide 125 mg. may be given in the afternoon if the child is restless when the rash develops; 250 mg. in single or divided doses at bedtime ensures a good night’s sleep in spite of coughing. I encourage a warm humid atmosphere in the room by various methods: some electric fires and most electric toasters allow an open pan of water to rest on top; an electric kettle blows off too much steam to be kept on for more than short periods. Parents, conscious of the need to darken the room and to forbid reading, may carry this to an unnecessary extreme, starting even before the rash appears. To save a mother some demands, the wireless is a boon to children in darkened rooms. They are allowed up when the rash fades from the abdomen-usually the fourth or fifth day-and may go outside on the next fine day. Apart from fruit to eat, solid food is avoided on the day the rash is appearing; fruit drinks or soups are all they appear to want. Complications. – So far few complications have arisen. Four cases of otitis media occurred in the first 25 children, but only one had pain. No case of pneumonia has occurred, but one child had grossly abnormal signs in the chest for a few days after the fever subsided, uninfluenced by oral penicillin. One girl had a tear-duct infection and another an undue blepharitis. Of three adult males with the disease, two have been more severely affected than any of the children. We make no attempt to prevent the spread of measles, and would only use gamma globulin to mitigate the severity of the disease in the case of the exposure of a susceptible adult or child who is already severely debilitated. Bed rest, for seven davs for moderate and severe cases and of five to six days in mild cases, seems to cut down the incidence of such complications as secondary bacterial otitis media and bronchopneumonia. We have not been impressed by the prophylactic or therapeutic use of antibiotics and sulphonamides in the first week of the disease. As soon as the patient is out of bed we allow him out of doors almost regardless of the weather. Otitis Media and Bronchopneumonia.-These conditions often appear so early, sometimes even before the rash, that in such cases one can only conclude that the responsible agent is the virus itself.Despite their initial alarming severity, they tend to resolve spontaneously, and treatment apart from first principles seems useless. When, on the other hand, otitis media or bronchopneumonia comes on after the subsidence of the initial symptoms of measles, it is probably due to a secondary bacterial invader, and we find antibiotics or sulphonamides useful….. The expected biennial epidemic of measles appeared in this region in early December, 1958, just in time to put many youngsters to bed over Christmas. To date there have been close on 150 cases in the practice, and the numbers are now steadily decreasing. Like previous epidemics, the primary cases have been chiefly in the 5- and 6-year-olds, with secondary cases in their younger siblings. No special features have been noted in this relatively mild epidemic. It has been mild because complications have occurred in only four children. One little girl aged 2 suffered from a lobular pneumonia, and three others developed acute otitis media following their measles. 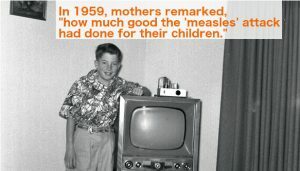 In the majority of children the whole episode has been well and truly over in a week, from the prodromal phase to the disappearance of the rash, and many mothers have remarked ”how much good the attack has done their children,” as they seem so much better after the measles. A family doctor’s approach to the management of measles is essentially a personal and individual matter, based on the personal experiences of the doctor and the individual character and background of the child and the family. In this practice measles is considered as a relatively mild and inevitable childhood ailment that is best encountered any time from 3 to 7 years of age. Over the past 10 years there have been few serious complications at any age, and all children have made complete recoveries. As a result of this reasoning no special attempts have been made at prevention even in young infants in whom the disease has not been found to be especially serious. No doubt better nutrition and living standards play a part in determining the mildness of measles in Britain to-day, but it is probable that, there is some natural immunity to the disease in this country. This has little effect in preventing attack but appears to protect against death. The article also identified the problems a population might incur by relying on vaccination for protection against measles; :Thus if measles was eradicated by vaccination a high rate of vaccination in future generations would be essential to maintain herd immunity. If herd immunity were allowed to wane at a later date-and it is notoriously difficult to maintain a high rate of vaccination against a non-existent disease -then the reintroduction of measles from another country might result in epidemics in both children and adults much more severe than are seen in Britain to-day. These are problems which need further thought” So not only have we replaced normal childhood illness with chronic autoimmune disorders like asthma, vaccinations may have compromised the immune systems of generations of children which are going to have difficulty in dealing with these infections. Tagged Measles, pharmaceutical industry, vaccine manufacturers. Bookmark the permalink.